AM Technologies: The Company "Shaping the future of Manufacturing"
Following the success of formnext last week, AMFG is taking a closer look at some of the innovative companies that showcased at the Frankfurt trade fair. 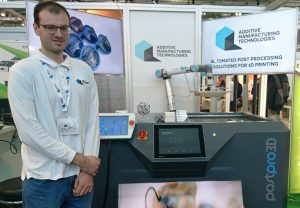 This week, we’re speaking with Dr. Konstantin Rybalcenko, Development Manager at Additive Manufacturing Technologies, to talk about the company’s revolutionary new technology, his experience at formnext and his thoughts on the future of additive manufacturing. Post-processing is a critical stage in the additive manufacturing process – and yet, many post-processing techniques remain manual. As a result, post-processing is often a labour-intensive and costly element in the manufacturing workflow. But Additive Manufacturing Technologies (AMT) is pioneering the move to change this. Founded in 2015, the Sheffield-based company provides automated post-processing solutions for 3D-printed polymer parts. Using its patent pending PostPro3D technology, it provides high-quality surface finishing of Multi Jet Fusion (MJF), Laser Sintered (LS), High Speed Sintered (HSS) and FDM components. Dr. Rybalcenko: For me, a key highlight has been having the opportunity to speak to a whole variety of people within the industry. AMFG: What is a key highlight of AMT’s PostPRo3D machine? Dr. Rybalcenko: To my knowledge, we have created the world’s first automatic post-processing machine. This is new because much of the post-processing techniques at this stage are usually done by hand. AMT’s new technology tackles a key issue in the post-processing stage: the surface finishing of 3D-printed parts. With the PostPro3D machine, this process will be made quicker and much more efficient. 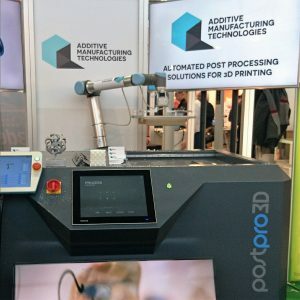 And the company is certainly on its way to achieving its goals: in February, AMT received a grant of £624,000 from Innovate UK to develop the next generation of the PostPro3D machine. It also announced its partnership with Midwest Prototyping, a leading service bureau in the US, in August this year. “We’re really aiming to shape the future of manufacturing,” says Dr. Rybalcenko. The PostPRo3D surface-finishing technology uses the proprietary post-processing finishing process, PUSh, which was developed by the University of Sheffield. Walking us through the machine, Dr. Rybalcenko explained: “The process is quite simple. You fill in the chamber with your parts, close the lid and select the process. The finished parts have no trace of any chemicals, and the machine does not affect any delicate features of the part in any way. It’s also entirely suitable for consumer-ready products, such as glasses, for example. Ultimately, the PostPro3D will reduce surface finishing time, tackling issues often associated with post-processing – namely labour and time costs. And with many companies currently outsourcing 3D printing jobs due to the labour-intensive nature of the post-processing stage, AMT may just have found the perfect solution for your company’s post-processing needs. You can find out more about Additive Manufacturing Technologies here. 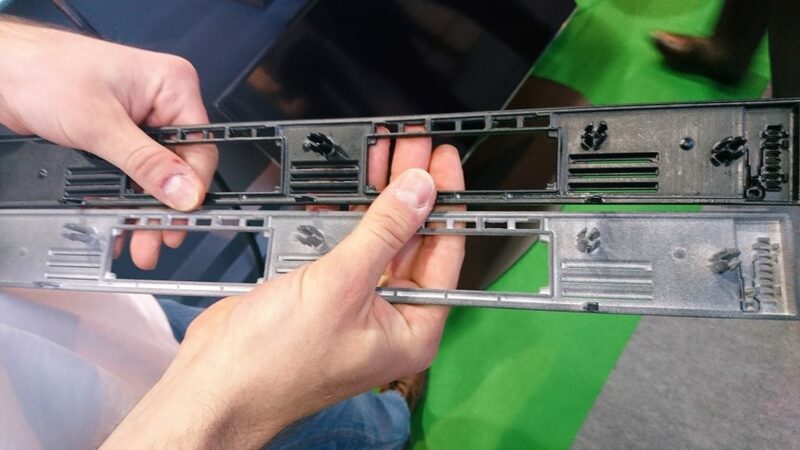 This article is part of our formnext spotlight series, featuring some of the companies that showcased at formnext this year. For more news, features and interviews, subscribe to our mailing list and follow us on social media.